Background The bacterial 16S rRNA gene has historically been used in defining bacterial taxonomy and phylogeny. However, there are currently no high-throughput methods to sequence full-length 16S rRNA genes present in a sample with precision. 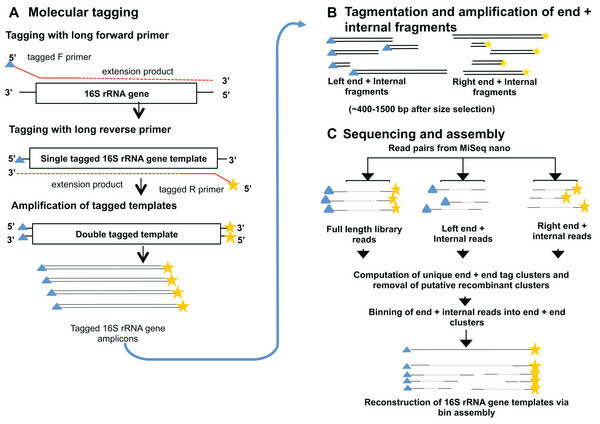 Results We describe a method for sequencing near full-length 16S rRNA gene amplicons using the high throughput Illumina MiSeq platform and test it using DNA from human skin swab samples. Proof of principle of the approach is demonstrated, with the generation of 1,604 sequences greater than 1,300 nt from a single Nano MiSeq run, with accuracy estimated to be 100-fold higher than standard Illumina reads. The reads were chimera filtered using information from a single molecule dual tagging scheme that boosts the signal available for chimera detection. Conclusions This method could be scaled up to generate many thousands of sequences per MiSeq run and could be applied to other sequencing platforms. This has great potential for populating databases with high quality, near full-length 16S rRNA gene sequences from under-represented taxa and environments and facilitates analyses of microbial communities at higher resolution.